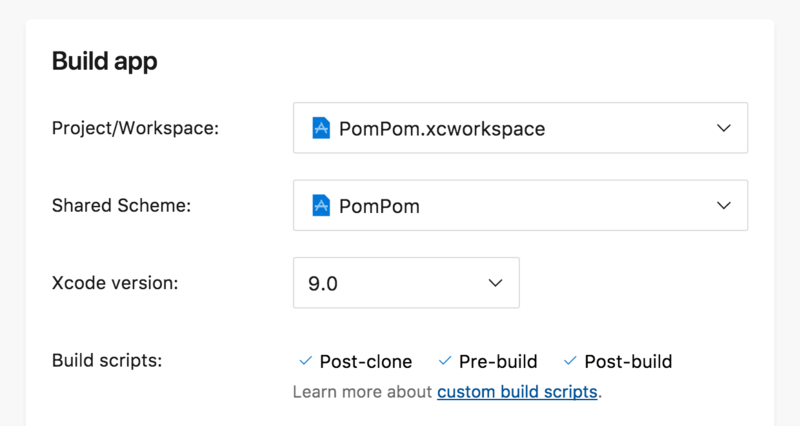 You can add up to three custom build steps that run at pre-defined stages during build time: post-clone, pre-build, post-build. Place the scripts with the format specified below next to the project-level (.xcodeproj, .csproj, .sln or package.json) file or module-level (build.gradle) file that you've selected in the build configuration and we will run them as custom build steps. For iOS and Android apps, we support Bash scripts, for UWP apps we support PowerShell scripts. If one of your scripts is failing, the whole build will fail. This way we ensure it won’t fail at a later time and therefore saves you build time. You can find a collection of build script examples on the dedicated public GitHub repository. We welcome contributions and suggestions - feel free to use the sample scripts, to modify them or to submit new pull requests with your most useful scripts, for the rest of the community to use them. Once your build scripts have been detected for the first time or you made changes to the location of scripts or where you store CocoaPods for iOS projects, make sure to save the branch configuration to apply the changes! This will perform analysis to index your repository tree and save the new build definition. The post-clone script runs immediately after the repository was cloned but before we do anything else on our end. The pre-build script runs before the actual build starts. For React Native apps, the script runs before generating source maps. For other platforms, it runs after we have installed dependencies from e.g. NuGet, CocoaPods or Carthage. The post-build script runs after the build has finished and we have copied all the necessary artifacts to the output directory. Note that the post-build script will run even if the build fails. echo "Current branch is $APPCENTER_BRANCH"
We set the following environment variables, so you can access them from your build scripts.